An Airline Crew uniform is an essential, and important way to make a flight attendant visible, for the onboard service, but especially, visible during an emergency situation. Which Airline uniform do you like? 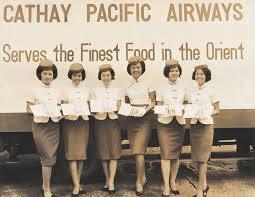 I remembered with fondness the SAA hostesses’ uniforms of the 70s. A couple of decades later I was working for a company in Europe, and to my surprise their office cleaners’ uniforms were almost identical, just without the logos. SIA’s Sarong Kebaya has really stood the test of time. It makes SIA cabin crew and SIA itself instantly recognisable around the world. I remember SIAs Sarong Kebaya from my first SIA flights in January 1973 (not long after SIA was founded) and it’s barely changed since. KLM especially for the female crews. They have a choice of skirts, trousers, Waistcoat..
3 designs, and always look impeccable, mostly blond! 1-4 Silver stripes for grade of staff, Gold on Ground. A Red Band for “Long service”. Very clear who you are talking too always. Male crews and Flight crews always also very smart, dark Blues and Gold Bands. They recycled the old fabric from uniforms, and integrated it into the new seating for the new cabins. Call me a philistine, but I have never paid much attention to airline uniforms. What I always make a mental note of are professionalism and courtesy of staff or lack thereof. I had always assumed that the KLM blue was a direct link to the blue in Delt pottery. Anybody else had this thought? Relating to the Branding of KLM, and the Uniforms of the crews, the aircraft colour is debated as coming from several sources. Delft pottery, the Blue Skies, Association with Royal Blue (but for the Orange House of Dutch Royalty), the Psychological calm and gentle soft feel that this shade of colour. Possibly water.I do recall the White Swan adverts, which added a great elegance to KLM. Back in 2011, KLM ran a competition to “Design your tile”, on which you face impression was given, and a few words beneath about what Travel and KLM meant to you. There was a very easy load up yr photo, and the System then placed that etched onto a tile with your words underneath, with about 12,000 entries from around The World, 2,500 were chosen by panels. They included different languages from many people Worldwide! It was an amazing project, and i was lucky in having my tile design chosen, and placed to the 772. They also still have flying the “Orange” front 773, that brought back Dutch Olympics winners. I saw this landing in Amsterdam a couple of weeks ago. Orange is considerably celebrated as “The Royal House of Orange”, as on Kings Day (formerly Queens day), and for World sports and National days. But Blue remains the Iconic Brand of KLM, 100 years This year, and Truly the worlds oldest Airlines. Qantas is 2nd. I hope that the food was rather better than the uniforms! Uniforms do give an image of both authority, smartness and service – however, as I mentioned on another thread, I do not like uniforms designed to make the wearer “eye candy” for the passenger (mostly in Asia) or the uniform worn to make the wearer look like a mess (mostly in America).